As I sat inspecting my mosquito bites and mud-soiled shoes near the trailhead, I heard pandemonium from deep inside the dense Croatian forest: a mixture of laughter, amazement, and dog yelps. I knew right then exactly what was going on – a truffle had been found, and by the sound of it, it was a big one. My colleagues and I are in the Croatian region of Istria scavenging for truffles with our guide from the Karlic Estate, and despite the rising welts on my forearms and neck I am close to euphoric. I could equate it to the truffle extravaganza I had at breakfast that morning, but the far more likely reason is my trip in Croatia up to this moment has been full of culinary delights and incredible scenery. 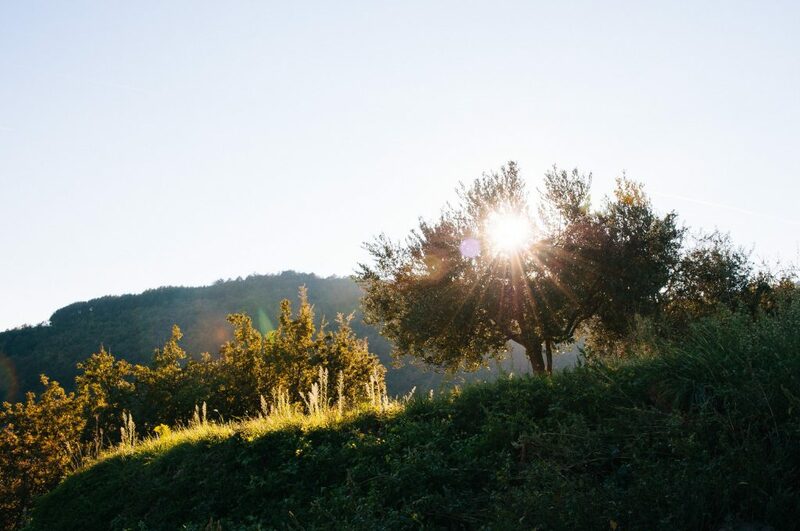 Istria is a place of understated beauty: rolling hills broken up by patches of olive groves and vineyards, peak after peak of picturesque villages, and the occasional glimpse of the sea. My Istrian journey began in one of these villages, Motovun. This medieval village’s history precedes the 1st century with ties to ancient Roman inhabitants. However, in the 14th century Motovun was governed by Venetians who fortified the city with huge stone walls, which are still intact today. But, as gorgeous as the architecture is, the true highlight for me in Motovun was a private performance of the town’s klapa group. 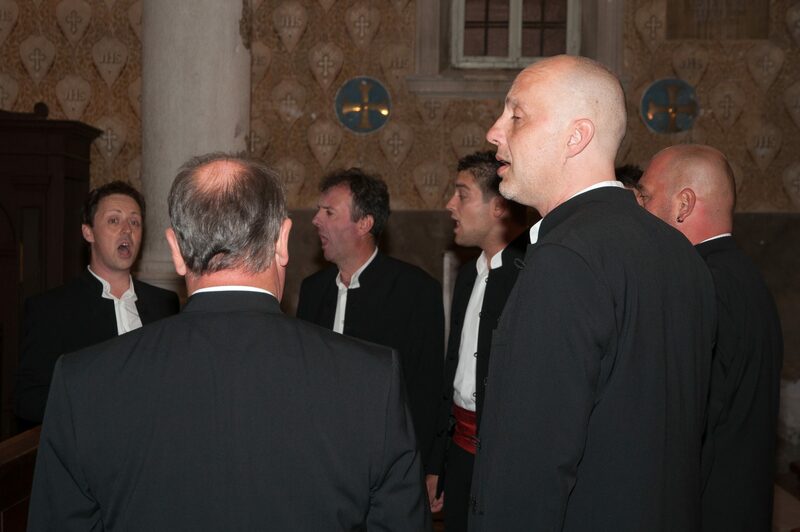 Klapa is a traditional a cappella singing style practiced throughout the Dalmatia region of Croatia, in which songs typically express themes of love, wine, the land, or the sea. The klapa performance I attended took place in Motovun’s Church of St. Stephen where the all-male singing group’s perfectly pitched voices bounced beautifully off of the painted frescoes on the cathedral ceiling. The following day my colleagues and I set off with our guide from Istria Tourism, Marko. 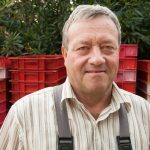 The plan was to arrive at the Karlic Estate to sample some fine truffles and learn a bit about the truffle industry. 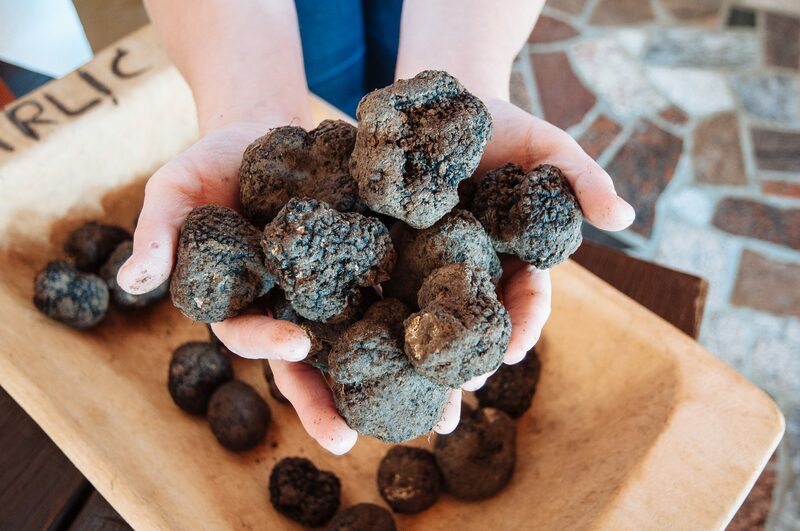 After absorbing a few facts concerning both white and black truffles our host, Radmilla Karlic, whipped up some delicious recipes that she thought showcased truffles best. 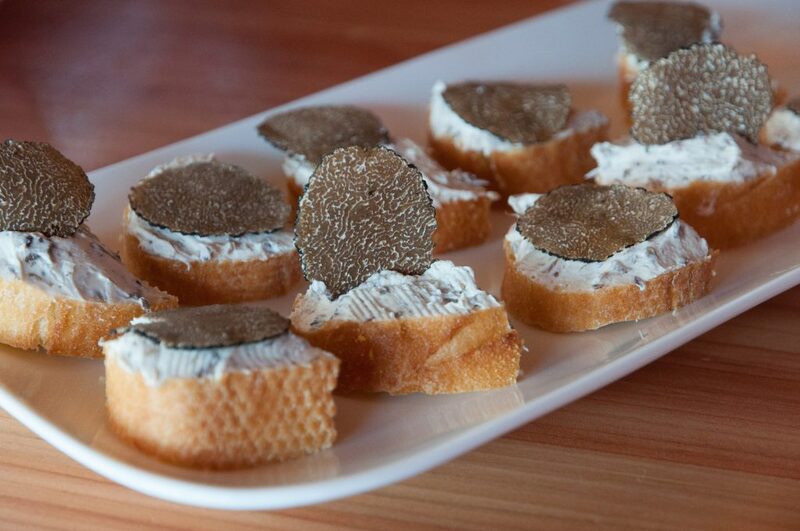 The first dish consisted of slices of baguette and a cream cheese-like spread, topped with a slice of gorgeous black truffle. Our second dish was one that Radmilla particularly recommended as she noted how well the flavor of the truffles would be pronounced: scrambled eggs with mild parmesan cheese, and of course, a generous amount of shaved truffles on top. 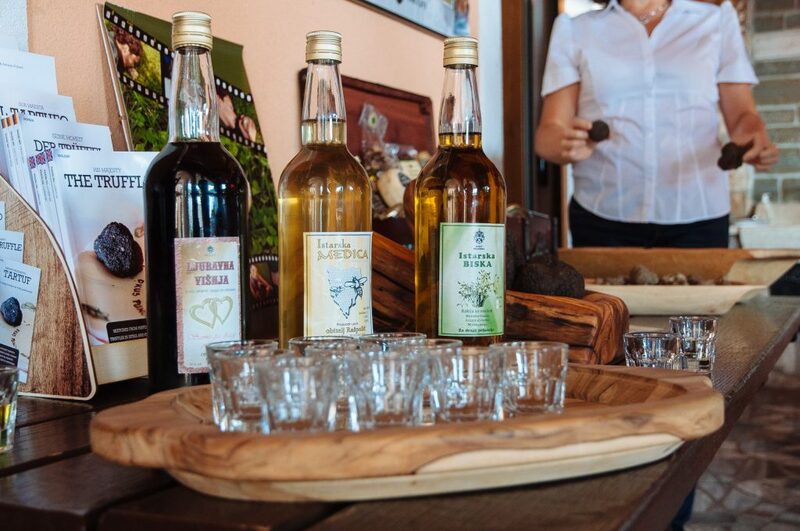 The meal was incredible, and afterward, we were served some strong Turkish coffee while we perused the Karlic gift shop where the mouthwatering products ranged from truffle flavored butter to freshly made pork sausages laced with truffles. Had I known that leaving the shop and going into the woods to hunt for truffles would have led to the aforementioned mosquito fiasco I probably would have stayed put, opting for rounds of crisp white wine and truffle laden snacks! The tour of Istria then led west to the seaside town of Novigrad, a small village that appeared to have more fishing nets than people. Arrangements were made for us to join local chef, Marina Gasi, in her restaurant Konoba Marina for a light lunch. Chef Gasi’s restaurant is unique in that she doesn’t have a menu, instead she prefers to cook dishes which inspire her day-to-day. Her inspiration usually hits her while walking through the Novigrad fish market, and what caught her eye on the day of our visit was sole. Chef Gasi prepared the sole sashimi style, laying the cuts atop a bed of purple grained rice that was then lightly seasoned with a very light citrus dressing. She stated that this type of dish is indicative of her cooking style as it really emphasis the freshness of the seafood. 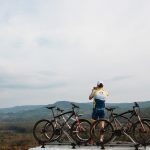 We had all over-indulged, so our guide thought it would be a good idea to do a little mountain biking through the countryside around the village of Groznjan. We readied the bicycles and equipment then began our descent. A tunnel here, an olive grove there—there was so much beauty our guide had trouble keeping track of us as there were so many scenic bluffs from which to photograph. 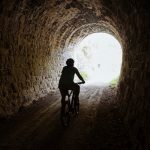 This ride was a good warm up for my legs considering I would be doing much more in the next few days throughout the Dalmatian Islands with VBT Bicycling and Walking Vacations. After our ride, Marko thought it would be a good idea to head to nearby Benvenuti Vineyards for a tour and some refreshments. We were greeted by Livio Benvenuti and his son Nikola who were very pleased to have us. We toured the vineyards, the storage cellars, and the tasting room. For me, watching the sun go down out in the Istrian countryside with a chilled Benvenuti white wine was the perfect way to say good bye to this agriculturally rich land. 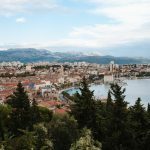 The following morning we were up early for a short flight and drive that led to the charming coastal city of Split, a city with a healthy symbiosis of tradition and modernism. 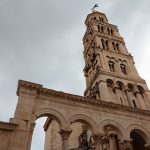 The main attraction of this city is undoubtedly Diocletian’s Palace built around 300 A.D. Now, when I say palace most will conjure up visions of UNESCO-run tourist sights which are roped off in certain areas and completely void of life once closing time hits, not Diocletian’s Palace. Here the tight labyrinth of stone alleys is crammed with cafes, restaurants, and bars all buzzing well into the early morning. In addition commercial buildings, the palace also contains apartments within its walls and in these 220 buildings there roughly 3,000 residents. We met with our guide for the day, Dino, who gave us a tour of the palace grounds— something I highly recommend, as there were many aspects of the palace I would have overlooked had Dino not been able to provide the history. The whole palace is truly remarkable but my favorite area had to be the Basement Halls. There are vendors selling goods, and the cavernous basement is unreal. It is a little amazing to think of all the chaos ensuing over your head on those bustling lanes within the palace. 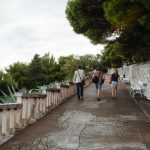 After leaving the palace walls we walked down the Riva, a promenade lining part of the Split Harbor where everyone from fisherman in overalls to 20-somethings in stilettos has a few minutes on the catwalk. While an audience of cappuccino sipping café patrons take notes on the latest fashion dos’ and don’ts. 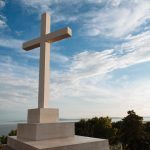 We continued walking west past the Riva’s end towards Marjan, a hilly nature reserve with trails, scenic lookouts, and a historic chapel. Seeing Split from a bird’s eye view gave me a better idea of how busy the harbor and smaller surrounding islands were as boats of all sizes seemed to be in a constant ebb and flow between them. That evening in my hotel room, within the palace walls, I sat listening to the noise below. I heard a handful of languages, a whole lot of laughter, and the occasional clinking of glasses. 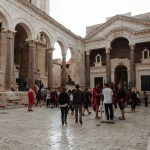 For me, these sounds are representative of my time spent in Croatia: a country whose identity has been molded by various cultures throughout history. 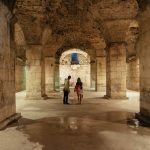 Regardless of where you are in the country, the locals are inviting and eager to show you Croatia through their eyes. For highlights of Colin Roohan’s tour through Croatia, click here. Colin Roohan is a travel photographer interested in documenting experiences with culture and life. In addition to his work with AFAR, Colin has been published in Travel + Leisure, The Royal Geographical Society’s Hidden Journeys, and Groove Magazine, amongst others. In addition to journalistic pursuits, Colin captures portraits and documents events around Southern California.